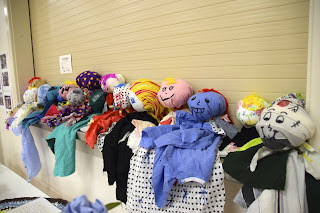 For the enjoyment of those attending the Ravensthorpe Wildflower Show Gala Dinner on Saturday 19th September, the Ravensthorpe District Art Group presented their Wearable Art Exhibition. This included a static display and a fun catwalk presentation. Entries were based on the theme of Our Natural Environment and judged on relation to the theme, Aesthetic Beauty, Workmanship, Design and Originality . Compered by the delightful Sabrina Hahn, decked out in a vivid cape created by the RDHS Art Students specifically for her to wear at this occasion, the entries showcased the creative talents in the community. Milena, Chloe & Taylah Wisewould were inspired by their family farming background and their outfits were made from "wool packs". With branding representing the description of the wool and the girls accessorising their outfits with ear tag jewellery. Lilly Button was a vision in her pink Hibiscus creation and Rachel Daw was inspired by the iconic Qualup Belle. A number of entries were the result of the felting workshop held earlier in the year and included Brenda Caelli’s elegant Fringed Lilly Collar in a vibrant blue and Jen Biddulph’s Flutterby. We were awed by the beautiful Owl Dress by Melissa Daw and the Queen of the Blue Mallee, a very avant -garde creation by Tracie Chambers. Wildflowers, paperbark, mallee and salmon gum themes shone through in the designs with recycled, natural and found materials used in the creations. Judy Harp’s beautiful waistcoat “After the Rain” featured front panels made to represent the trunk of the tree outside Jude’s Kingsmill Street house when shedding its bark and wet from the rain. Madeliene Norman used wool alpaca and sisal to create Paperbark vest; Jessica Wright used stamps to created black and white botanical prints and Wildflower Show Coordinator Jeanette Denham glimmered in mallee leaves. A flickering fish bowl crowned The Great Escape, an eye catching, fiery, entry by Jodi Edwards.. Also noted for its “attitude” was Summer in Hopetoun, the static entry by Pat Meadows and Mary Robinson. This mannequin certainly caught the eye, a woodland nymph on the loose in the Ravensthorpe Town Hall. Mystique Monique also travelled up from Hopetoun for the event as did Life’s a Beach. These beautiful entries helped create the atmosphere for the evening and their natural theme complemented the Gondwana Link series of photography which was locally presented by the Ravensthorpe CRC. All the entries were highly commended by our judges with the overall winner being Red Flowering Gum by Judy Harp. “A Beautiful garment meeting the overall criteria of the exhibition and capturing the artist’s feel for the local environment”. Various types of yarn were sewn between washaway to represent the colours of the bush. It was decorated with leaves and flowers of the red flowering gum tree. Sabrina Hahn is now the proud owner of this lovely shawl. A big thank you to all the participants of this exhibition and congratulations to the Ravensthorpe Wildflower Show for this excellent event. 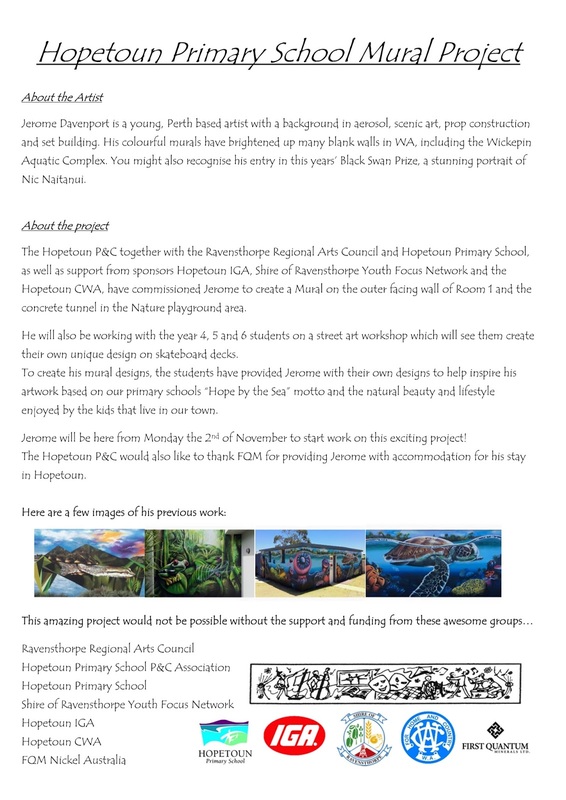 The Ravensthorpe District Art Group would also like to acknowledge the support from the Ravensthorpe Regional arts Council for this event with the sponsoring of the Felting Workshop and the use of the mannequins. We are currently planning a further felting workshop for 2016 and a textile workshop. Please contact Jenny Chambers for more information . Ph. 0429 381018. Sabrina Hahn rocking the frock made by RDHS students. Madeleine Norman and Jen Chambers wearing their amazing creations! 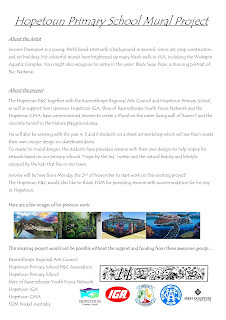 The Ravensthorpe Regional Arts Council's latest collaboration project will be starting next week at the Hopetoun Primary School!! Such an amazing opportunity to have a visiting artist to the school. Watch this space for updates on the project.